The ground-dwelling rock ptarmigans depend on camouflage for defense, and to achieve this in the changing background of their northerly range, they adopt different plumages. The summer plumage is mottled to blend with the forest, while during the winter snows ptarmigans have white plumage, only the tail feathers remaining dark. Rock ptarmigans feed on leaves, buds, fruits and seeds and on some insects in the summer. They are monogamous birds; the male defends a small territory at the breeding grounds. 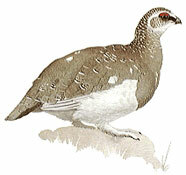 The female lays 6 to 9 eggs in a leaf-lined hollow on the ground and incubates them for 24 to 26 days.ys. The cygnets must make the long migration south when only 80 to 90 days old.